Title NoteTitle based on provenance of fonds. Administrative/Biographical HistoryDavid (b. 1926, Siedlec, Poland) and Regina (b. 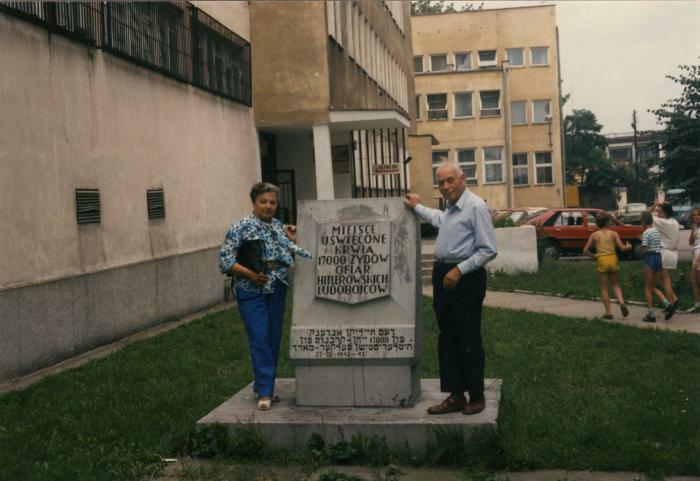 1931, Będzin, Poland) Feldman, both survivors of the Holocaust, immigrated to Canada in 1948. David was brought over as part of the Tailor Project, and eventually found work in Vancouver as a denturist. Regina worked in the alteration department of Cordell's Ladies Wear, and later helped children and the sick in the Jewish community in Vancouver, and raised funds for Israel. They met at a Jewish Community Centre in Vancouver, were married in 1950, and had three children: Alan (who passed away at age two), Gail (also deceased) and Gary. The Feldmans travelled back to Russia and Poland to visit in later years. Both provided Holocaust testimonies to the Vancouver Holocaust Education Centre. Scope & ContentFonds consists of identification papers, travel documents, letters of reference, ephemera as well as family photographs and heirlooms. Records document the Feldmans’ experience of the Holocaust in Poland, specifically their time in displaced persons camps, in Bergen-Belsen, as well as their immigration to and life in Canada. Fonds is divided into the following series: Regina Feldman series ([1923? ]–[196-]) and David Feldman series ([18--]–1990). NoteVideo recording of July 22, 1993 and August 3, 1993 donor interviews are available for viewing by request. Tapes 1 and 2. Select items only have been digitized and described to the item level. Other items have been digitized as media representations of fonds, series and sub-series-level descriptions. Consult the archivist for more information. System of ArrangementFonds is arranged into series and sub-series by the archivist. Item-level descriptions are based on legacy Filemaker Pro database records. Fonds consists of identification papers, travel documents, letters of reference, ephemera as well as family photographs and heirlooms. Records document the Feldmans’ experience of the Holocaust in Poland, specifically their time in displaced persons camps, in Bergen-Belsen, as well as their immigration to and life in Canada. Fonds is divided into the following series: Regina Feldman series ([1923? ]–[196-]) and David Feldman series ([18--]–1990).